Canada’s Patrick Chan performs his long program at 2016 Skate Canada. 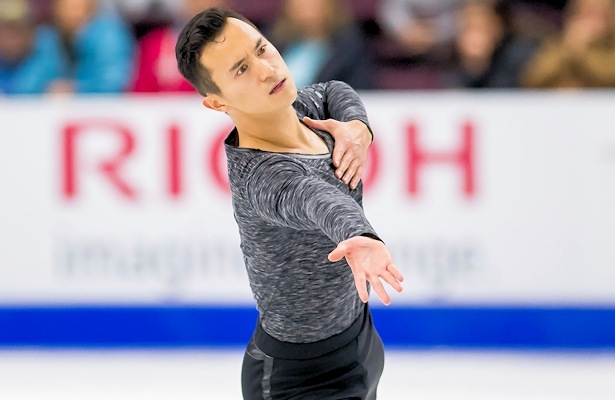 Canadian Patrick Chan repeated as Skate Canada champion with a long program, which despite some problems – including two doubled jumps – featured his first attempt at the quadruple Salchow. Despite falling on the trick, he scored 176.39 in the free skate for a total competition score of 266.95. The program was layered with soulful choreography and emotive transitions to music entitled “A Journey,” composed by friend and pairs skater, Eric Radford. Chan chose not to shy away from the additional quadruple which he says he will need later in the season to compete against the world’s best. In a storyline repeat of the 2015 Skate Canada International, 2014 Olympic Champion Yuzuru Hanyu rallied back from a poor short program to clench the silver medal. The world record holder in the short and long program scores performed to “Hope and Legacy” by Jo Hisaishi and managed two smooth quadruples and two triple Axels to score 183.41 for a winning free skate and a total score of 263.06. “I am a little satisfied for my second toe,” the four-time Japanese national champion added, referring to the silver-lining quadruple toe loop achievement late in the program. Kevin Reynolds managed an impressive comeback after a hip injury which has effectively side-lined him from competition since the Sochi Olympics. That glory, helping Canada win silver in the team event, has seemed a lifetime away given the 2013 Four Continents champion’s struggles to return to his elite form. Stepping onto the Skate Canada podium with a bronze medal, thanks to his free skate score 164.49 and total competition score of 245.06, was a long-due treat. The lithe skater landed three quadruple jumps and a triple Axel in his program to the soundtrack of Grand Piano. “To do improved performances in just three weeks’ time gives me lots of confidence,” he added, referring to his silver-medal finish at Ondrej Nepela Trophy earlier this month. Michal Brezina of the Czech Republic catapulted from ninth to fourth overall with a free skate score of 157.06 (227.42), while Israel’s Daniel Samohin placed fifth (226.53). Takahito Mura of Japan plummeted from second to eighth place overall (222.13) after an error-filled free skate (140.89). Chan resumed his place as the leader after the Skate Canada men’s short program. A clean quadruple toe-triple toe kick-started his program set to “Dear Prudence” and “Blackbird” by The Beatles, a reworked exhibition program. However, a fall on the triple Axel thwarted the prospect of setting a new personal best score. The judges awarded him 90.56 points. Comparing his short program theme this year to last season’s, which despite its zip, gave him challenges, Chan thinks the choice of a more relaxed and carefree theme was strategic, even if subconscious. Flanked by his new coaches – Marina Zueva “the overseer” and Oleg Epstein “the technician” per Chan – it was the first major competitive glimpse of Chan without former coach of five years, Kathy Johnson. In second with 81.24 points, Mura stepped out of his opening quadruple toe loop but rallied to land a solid triple Axel and triple Lutz-triple toe combination during his flamenco routine. Despite the fight, the 2014 Four Continents Champion did not impress the judges with his other elements and received a level two grading for the step sequence, flying sit spin and change-foot sit spin. Canadian favorite Reynolds attempted two quadruples in his Finnish folk program, but underrotated the opening Salchow in his combination. The 2013 Four Continents Champion was ranked third with 80.57 points. In a disastrous short program, Hanyu finished fourth with 79.65 points. The skater opened up early on his quadruple loop attempt and tripled the Salchow with a pitched landing, however, his triple Axel, spins, and footwork during the Prince number were impressive. Daniel Samohin of Israel finished fifth, followed by Han Yan of China.